After three weeks of work, another development sprint is over. So time for another report for our fellow geckos. As usual, quite some time was invested in boring bug fixes and small non-obvious improvements, but we also have some interesting stuff to talk about. We wanted to talk about this feature not only because it has a visible impact in the user interface, but also because it’s a great example of collaboration among the different roles present in a Scrum Team. Formerly our Scrum development team was only formed by the developers of the YaST Team at SUSE. For this sprint (and future ones) the Scrum Team has been powered up with the addition of Ken Wimer as UI/UX expert and Jozef Pupava, one of the openQA.opensuse.org and openQA.suse.de operators. We got a feature request to make encryption more visible in this dialog. Being software developers used to tools like Vim and Git, we have to admit that the YaST team found the dialog perfectly usable and was having hard times thinking on a better alternative. Fortunately, we now have a UI/UX expert able to bring better alternatives like this one we finally implemented. This kind of visual changes in the installer used to cause delays in openQA, because adapting the tests while keeping the openQA machinery running is not always trivial. The great news is that it didn’t happen this time because our particular openQA superhero was already watching over our steps all along the process. So welcome into our Scrum process, Ken and Jozef! A new feature was added to the installer making it possible to quickly adjust several settings for the installation with one shot. You can see a detailed description of the feature, including several screenshots and configurations options in this wiki page at the Github repository of yast2-installation. And yes, for the impatient we also have a glorious screenshot! 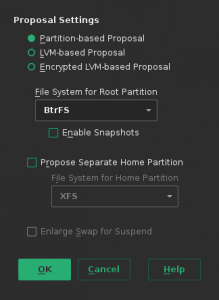 We have already explained in previous reports that we are performing an integral rewrite of the code managing partitioning and other storage tasks. 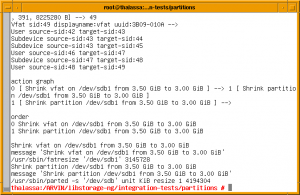 During this sprint, the brand new library gained the ability to resize all kind of partitions (Linux, Windows, swap, etc.). It’s nothing that is going to hit the users in the short term but at least we have a couple of screenshots to see the premiere working (yes, we know that screenshots of terminals are not the most fancy stuff). 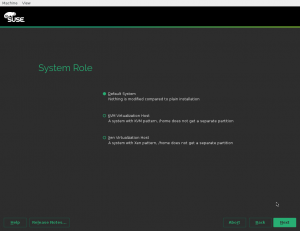 Starting on version 3.1.175, YaST is able to update itself during system installation. This feature will help to solve problems in the installer even after the media has been released. That’s a huge step towards improving YaST reliability. The workflow is pretty simple: during system analysis YaST will search automatically for an update. If such update is found, YaST will download, verify (using GPG) and apply it. Finally, the installation will be resumed using the new version. Nice! In the future, self update will be enabled by default. However, if for some reason you don’t want such a nice feature, you’re free to disable it. What is more: you can also craft your own update and use it instead the official one passing a custom URL to the installer. If you’re curious, you can check the technical details. One of the goals of rewriting the storage layer was to make possible to cope with all the over-complicated requirements involved in the proposal of a good bootloader configuration. This time we don’t want the different scenarios to simply pop-up over time in a bug-report-oriented basis and start aggregating more and more branches to the existing code in order to support every one of those “new” scenarios. 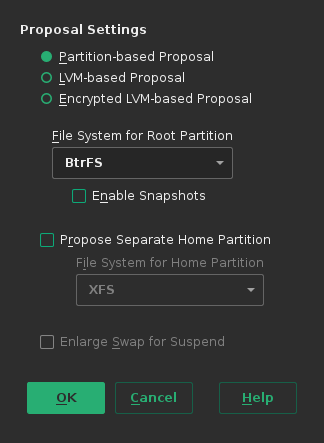 Changes will come, for sure, but we need a solid ground based in experts knowledge to start building a flexible future-proof code to handle partitioning regarding bootloader. Thus, we started a round of contacts with several experts in all the hardware architectures supported by YaST in order to capture all the knowledge from their brains into a set of Ruby classes. It’s still a work in progress since squeezing people’s brains is not always easy, but we already have some preliminary document. Continuous integration is a key aspect of software development, specially with methodologies like Scrum. Currently we use both Travis and Jenkins for it. Travis builds the pushed commits and pull requests at GitHub, while Jenkins takes care of the integration with the Open Build Service. We are investing quite some effort trying to use Jenkins for everything. If you want to know more about the reasons or how the progress is going, check the detailed documentation. As usual, this is just a small sample of the total work delivered by the team during the latest sprint (for Scrum and statistic’s lovers, it represents 34 story points out of a total of 87 delivered ones). Hopefully enough to keep you informed… and if it’s not, you know where you can reach us for more information! « TOSprint or not to sprint? thanks for the update, great work ! btw, when we will see these new features in Tumbleweed ? we send all changes immediatelly to Factory expect storage reimplmentation, which will be used as replacement when ready. Of course before it reach TW it have to pass openQA and various checks. So change in proposal should be already in TW. 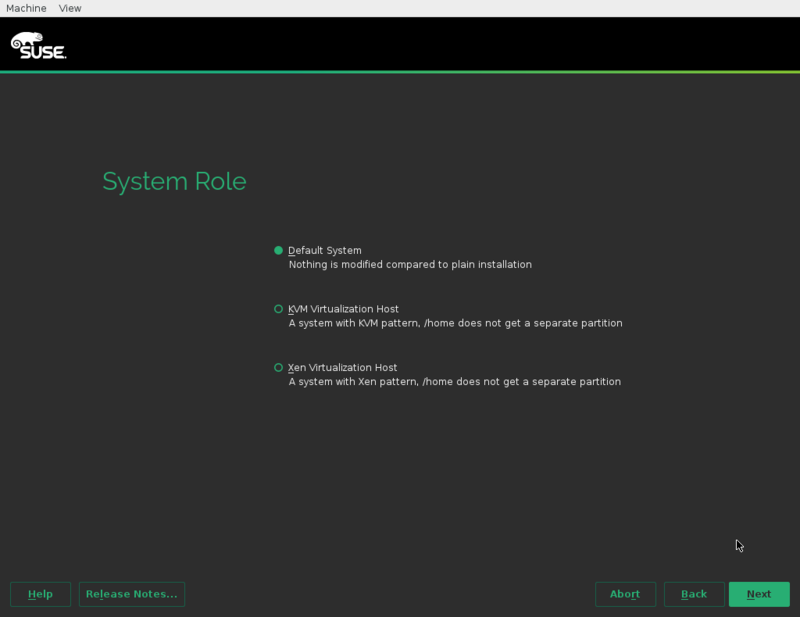 The system roles can be used, but need adaptation of opensuse control file where it have to be defined, so not visible yet. installer self update is not yet in TW and what is more important for TW it doesn’t make sense as DVD is always fresh enough, so probably opensuse release manager won’t create such update repository at all. And for consolidation of ci, we already have few modules that use jenkins instead of travis as Proof-of-concept, and plan is to continue with conversion and solve few features which disappeared after switch.